I had a jam-packed ride today. I am carrying my laptop, my shoulder bag and some purchases. It was also a two-ride travel because I have to stop by in a store to buy something. Since I am carrying already a lot of things, I planned to take a taxi even though it is expensive but I couldn't find one. So I waited and there was a jeepney that stops by so I decided to ride on it. It was a jam-packed ride because my co passengers had been carrying a lot of things. Some are carrying purchased kitchen utensils, others communication textbooks, bags and a lot of kids in the middle of the jeepney. I kept on holding on my things because it might scattered in the jeepney. 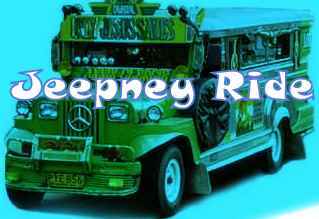 While on the way I kept on thinking how will I pass through inside the jeepney when I already arrived in my destination. The passageway in the middle was already blocked by kids and some things of the passengers. Thank God a lot of passengers go out in the jeepney in the same village where I live that there was no blockage anymore on my way. I was able to easily go out in the jeepney. What a jam-packed ride it had been.